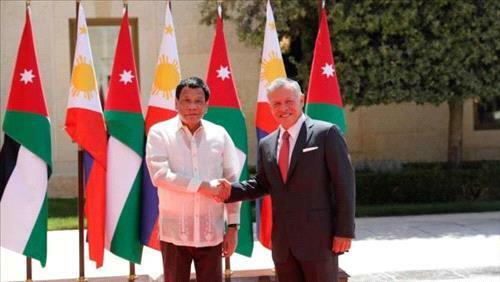 AMMONNEWS - His Majesty King Abdullah II on Thursday held talks with Philippine President Rodrigo Duterte at Husseiniya Palace on ways to enhance relations between the two countries and developments in the region. The talks, which were attended by Prince Ali Bin Al Hussein and a number of senior officials from the two countries, stressed the need to develop cooperation between Jordan and the Philippines in the economic, investment, tourism, energy, mining and military fields, as well as the importance of coordination and consultation between the two countries on issues of common concern. During the meeting, the King and the Philippine President agreed on the importance of building on the distinguished relations of friendship between the two countries, which extended for more than forty years. The talks also highlighted the privileges and incentives offered by the Jordanian economy in many fields and the opportunities to benefit from the strategic location of the Kingdom as a gateway to international markets, especially in the region and East Africa. The discussions also touched on the free trade agreements that Jordan has signed with many countries worldwide. At the beginning of the extended talks, His Majesty said: "If you’ll allow me on behalf of myself, my family, the government of Jordan and the people of Jordan to welcome you to Jordan on this historical occasion as the first president of the great nation of the Philippines [to visit Jordan] we are delighted to have you and your esteemed colleagues here." "I am confident that your presence here will really give us momentum into the future on so many fields, and I believe that this is a new era of cooperation," the King affirmed. "Earlier today, this was translated through agreements that were signed to advance our relations between government bodies, but also the people-to-people aspect," the King pointed out. The King highlighted the importance of meetings between the two countries' business people, saying: "I am really delighted that there are also members of the business delegation here in Jordan and I hope that this is an opportunity for me then to be able to come back to visit your country, not only with our government officials, but to bring also the Jordanian private sector to look at the tremendous opportunities that your country has to offer." On the war on terrorism, the King said: "I think one of the main things that bind us together is the scourge of terrorism, which is a challenge for our region and your region, for your country and my country." "Over the past year or two, the cooperation between our two countries to fight the evil that you have to suffer in your country as we suffer in ours, I think, is a testament to the international cooperation and coordination that is now becoming much more apparent," His Majesty pointed out. "This is an issue that is going to last with us not only to the next five to 10, 15 years hopefully, the military aspect will be very quick but it’s going to take us a while to overcome the prejudices and the mentalities that these very horrible, evil people perpetrate in your region and in mine," the King said. For his part, President Duterte said: "First I’d like to thank you and the state of Jordan for inviting me to be here with my members of the Cabinet and officers of the government." "I would also like, most profoundly, to thank the people of Jordan for hosting so many thousands of Filipinos to earn their living," President Duterte noted. "I also thank your kindness [and] benevolence. I have heard they’ve been treated very, very well, and so I am very happy also to hear that," he pointed out. "Our concern against terrorism brings us here Terrorism is the scourge of mankind today and it will take us a lot more years to stop it. I really do not know how long, but I hope that it will maybe end, not so much with this generation, but with the next generation for them to live comfortably," he affirmed. "I would like to assure you that we have come here to pledge our friendship, our cooperation, to you," he said. The talks also tackled the region's current circumstances, as the King stressed the necessity of reaching a just and lasting peace for the Palestinian cause based on the two-state solution and the establishment of an independent Palestinian state on the 4th of June, 1967, borders with East Jerusalem as its capital, living in peace and security alongside Israel. The talks also reviewed the anti-terrorism efforts, as the King stressed the need to intensify and coordinate regional and international endeavors to combat terrorism and extremist ideology within a holistic approach that addresses military, security and ideological aspects. Prime Minister, Minister for Foreign Affairs, Advisor to the King, Director of His Majesty's Office, King's Advisor for Economic Affairs, Chairman of the Joint Chiefs of Staff, Director of General Intelligence Department, Ministers of Social Development, Labor, Environment, Transport, Municipal Affairs, and Energy, as well as the high-profile delegation accompanying President Duterte, attended the extended discussions. On the sidelines of the Philippine President's visit to the Kingdom, the two countries signed a number of memorandums of understanding (MoUs). A memorandum of understanding was signed on the political consultations between the Ministry of Foreign and Expatriate Affairs and the Philippine Foreign Ministry, signed by the foreign ministers of the two countries. The two countries also signed a memorandum of understanding on defense cooperation between the Jordanian Armed Forces - the Arab Army and the Ministry of National Defense of the Republic of the Philippines signed by the Chairman of the Joint Chiefs of Staff and the Philippine Minister of National Defense. A cooperation framework was signed in the field of employment of domestic workers and a memorandum of understanding in the field of labor cooperation signed by the ministers of labor in the two countries. A memorandum of understanding was also signed between the two countries' investment authorities, signed by the Jordanian Minister of State for Investment Affairs and the Philippine Minister of Industry and Trade. A memorandum of understanding was signed between the Jordan Maritime Authority (JMA) and the Philippine Maritime Industry Authority, which was signed by the JMA Director General and the Philippine Ambassador in Amman.